In honor of today’s game, I present an excerpt from my book Dedham: Historic and Heroic Tales from Shiretown describing a little known episode in the history of baseball. Go Sox! Imagine you are in the bleachers at Fenway Park watching a playoff game between the Red Sox and their longtime rivals, the New York Yankees. It’s a close game, with Boston leading 59–55 and nobody out. The Sox have a man on second base. The New York twelve are spread out on the rectangle, waiting for the home team striker to take his knocks. Here’s the pitch—it’s a long fly ball, caught by the Yankee outfielder; he catches it and hurls it toward home, plugging the Sox runner square in the back. “You’re out!” hollers the referee, and the Yankees run off the field to take their knocks. Had a group of local baseball club presidents meeting in Dedham in 1858 gotten their way, scenes such as this one would be played out on ball fields around the country each summer, and Dedham would be known today as the birthplace of modern baseball. 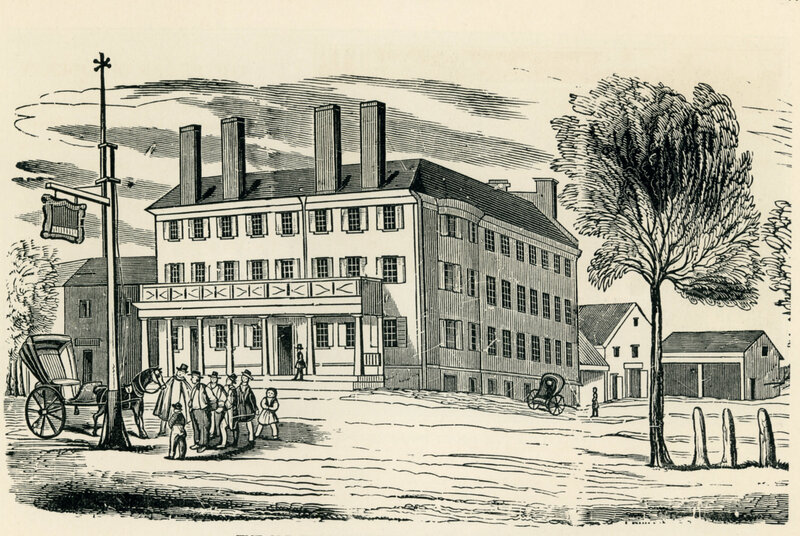 On May 13, 1858, the Phoenix House hosted a convention of the Massachusetts Association of Base Ball Players, which came to the High Street hotel to draft a set of rules and regulations for the “Massachusetts” version of the popular sport. The Phoenix stood on the corner of Washington and High Streets, where the K. of C. building is today. It burned down in 1880. Representatives from ten local ball clubs, including three from Boston and one from Dedham, worked all morning on drafting a constitution before breaking for a bountiful lunch supplied by Phoenix landlord J.D. Howe. According to Article I of the constitution adopted that day, the purpose of the association was to “improve and foster the Massachusetts game of baseball and the cultivation of kindly feelings among the different members of Base Ball Clubs in this state.” While B.F. Gould of Boston’s Tri-Mountain Club demonstrated “kindly feelings” as he addressed his fellow presidents that day, he made it clear that his club would be withdrawing from the association in order to play the game under the rival “New York” rules. The seventeen rules adopted by the association that day describe a game more like English rounders. The field of play was rectangular, unlike the diamond shape of modern baseball. Each team was allowed only one out per at-bat. Runners did not have to be tagged in order to be called out—a fielder could strike or “plug” the runner with the ball in order to make an out. The game ended when one team scored one hundred runs. The New York game, introduced by the Knickerbocker club in the 1840s, was much closer to modern baseball. There was a great rivalry between proponents of the two versions of the game, and for a while after the convention the Massachusetts game was becoming more popular than the New York game. But the New York rules were easier to follow and made for a more exciting game, and as the city itself emerged as the center of trade and industry in America, the New York game became the standard. The Civil War helped to spread the popularity of the New York game, and in 1871, the establishment of the first professional league, operating under New York rules, signaled the end of the Massachusetts game. The only rules from the Dedham Convention that exist in modern baseball are the overhand pitch and the called strike. After their long day’s schedule of meetings, the gentlemen who had gathered at the Phoenix naturally celebrated their hard work with a ballgame, which was well attended by townspeople. This entry was posted on April 8, 2011 at 6:36 am and is filed under History/Mystery, Lost Dedham. You can subscribe via RSS 2.0 feed to this post's comments. You can comment below, or link to this permanent URL from your own site. Were there vendor carts where you could purchase healthy sausage subs back then?